Members of the American Legion Family are recognized by the American Legion Department of Maryland and the National Organization. 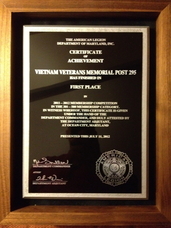 The awards presented to members of Vietnam Veterans Post 295 are presented here in the following order: National, Department, Post, Individual. Longevity Awards are recognized here. National Commander Daniel Dellinger, present the plaque for National Recruiter of the Year to Post 295's Commander Robert Ouellette. To the right are his with Cathy Ouellette, Past Maryland Department Commander Gary Vogt and National Membership Chairman Kenneth E. Orrock. recruited the most members in the Department during the current Legion Year. member who has recruited 50 or more members in the current Legion Year. for meeting or exceeding the All Time Post membership high. 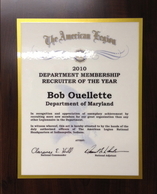 *The Department of Maryland terminated the 3 & 4-Star recognition program in 2010. Description: This award is designed to recognize every American Legion Post for meeting or exceeding the 100% of the previous years membership. 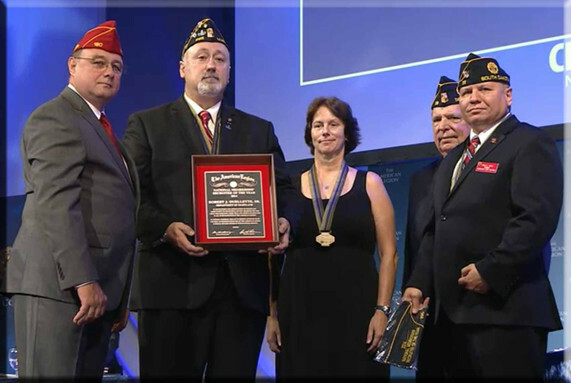 Description: This award is designed to recognize American Legion Posts for meeting or exceeding 120% of their membership goal. Description: This award is designed to recognize American Legion Posts for meeting or exceeding 110% of their membership goal. Southern Maryland District County Commander of the Year selected from County Commanders from Anne Arundel, Calvert, Charles, Montgomery, Prince George's and St Mary's Counties. Bob Ouellette served as Montgomery County Commander for 3 terms, 2002-2003; 2003-2004 and 2008-2009. Ouellette achieved 100% Membership Goal as County Commander in 2004 and 2009.
percentage in each category by the cutoff date in January. 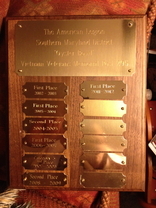 Description: This award is designed to recognize American Legion Posts for the current Legion Year. George W Harrison website award award will be given to the Post with the best website. Post must submit a complete form, "Best Post Website" by June 1 of the year to be considered. 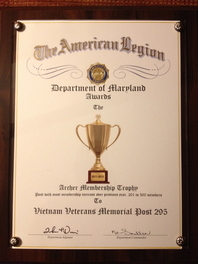 In addition, the Post must've been an active website for the entire award year this is to be recognize for the efforts of posts communicating the four pillars of the American Legion and making post information available to its members and the public via the Internet. 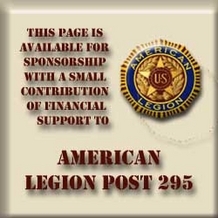 The more exposure we achieve increasing in this increasingly complex electronic media world the more people will understand what the American Legion does for our Community, State and Nation. Description: To be awarded annually to American Legion Posts for having 100 per cent, or more, of the post's previous year's membership enrolled for the coming year by December 31. The American Legion Baseball Program is the corner stone of Post 295’s Children and youth Program. Youths from local high schools participate in baseball programs, ages range from 16 to 18. This award is designed to recognize American Legion, American Legion Auxiliary or Sons of The American Legion members who are actively involved in the Scouting program. This award is not meant to be a selective or limited award, but one that is available to any American Legion, American Legion Auxiliary or Sons of The American Legion member who completes the requirements for the award. The award is meant to recognize dedication and work required by an American Legion, American Legion Auxiliary or Sons of The American Legion member to assist in furthering the Scouting program in The American Legion. the principles of the American Legion.